Two competing models for selecting economic-stream immigrants are now prevalent in advanced industrialized economies: points-based and employer-led selection. As this report demonstrates, however, hybrid selection systems increasingly are being created, implementing best practices from each selection process. Points-based systems admit immigrants with a sufficient number of qualifications from a list that typically includes language skills, work experience, and education. Points systems appeal to policymakers because they are transparent, flexible, and can be adjusted to meet evolving economic needs or respond to effects of immigrant integration. But since employers are not involved in selection, points systems often admit immigrants unable to find work at their skill level once they arrive. This undermines integration and the long-term economic benefits of immigration. Employer-led systems allow employers to select the workers they need, subject to government regulations. Being selected by an employer is evidence that immigrants’ skills are needed and guarantees they will have a job when they arrive. However, it raises concerns that employers may manipulate the system to access cheaper labor or that workers will be too dependent on their employers (and vulnerable to exploitation). 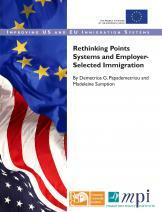 Immigrant-receiving countries that once favored purely points-based or employer-led selection systems are increasingly developing hybrids that have much of the flexibility of points systems while prioritizing employer demand. As a result, some of the most successful immigrant-selection models rely on temporary-to-permanent visa pathways that admit workers initially on temporary work permits but provide a clear path to permanent residence to those with good integration prospects.